No waiting overnight for a marinade, all done in a couple of hours. Who hasn’t felt like a creamy, spicy butter chicken on a Sunday afternoon, about 4ish, for dinner, and then realised that most of the recipes call for 75 different spices and a minimum of a 24 hour marinade in the fridge? No? Oh, well, I often do. I’ve come up with a recipe for one that you start at 4, takes an hour marinading in the fridge and can be on the table by 7. Yep, only 3 hours tied to the stove on a Sunday arvo. Actually, apart from the marinading time the most time consuming part of it is cooking it out for 30 minutes. The recipe looks a little daunting, but the ingredients should be readily on hand, or can be replaced if they’re not. I do that all the time. If I don’t have it, I replace it. 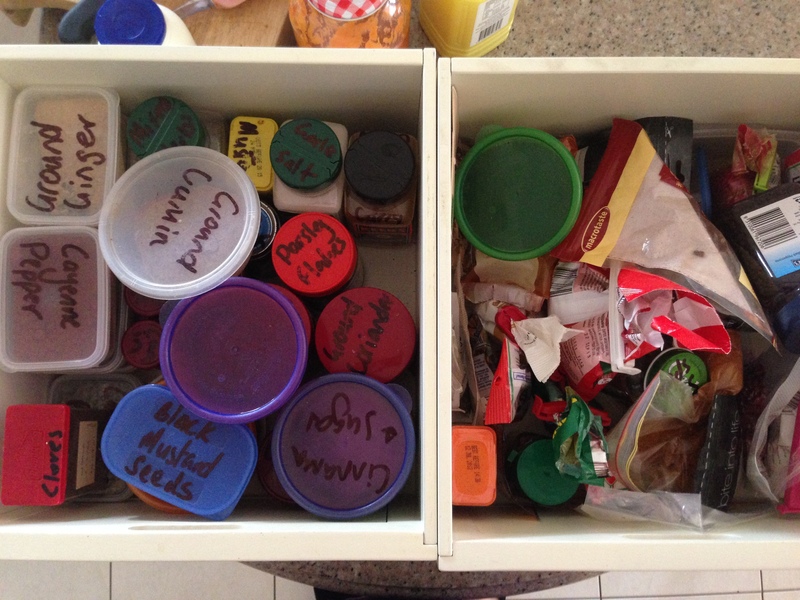 These are my spice drawers. Yes, there are two of them. I like to buy spices. Especially so I can forget I have them and then buy more of them the next time I’m at the Indian Grocer, so I end up with 6 different types of garam masala. I will eventually use it all. Do you have a penchant for peeking in your friends pantries? I do. Your pantry can tell you a lot about your personality. Mine, for example tells you that my pantry is cleaner than my bathroom. That’s because I spend more time in my pantry. Put all the ingredients for the marinade into a container with the chicken. Pop in the fridge for an hour, at the very least. 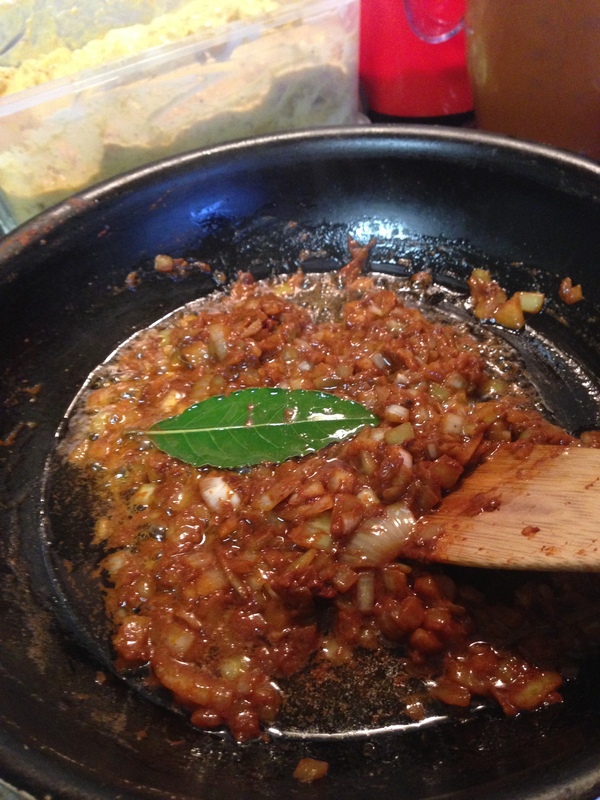 When it’s time to cook it, fry off the onion, cardamom, butter, cinnamon, bay leaf, tomato paste and paprika til the onion is soft. 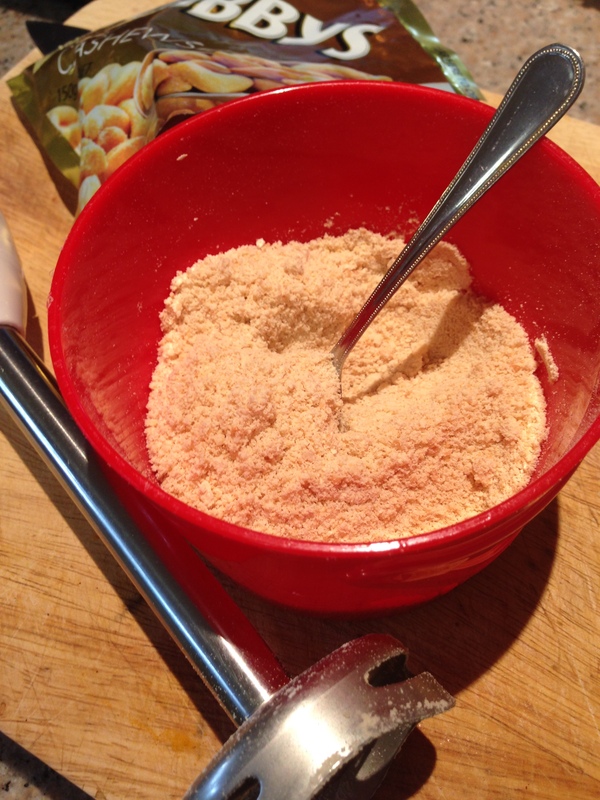 Take about 100gms of the cashews and blend them up. I used my stick blender, but had to put a tea towel over it as it shot cashews fair across the other side of the kitchen. Whoops. Someone could’ve lost an eye. 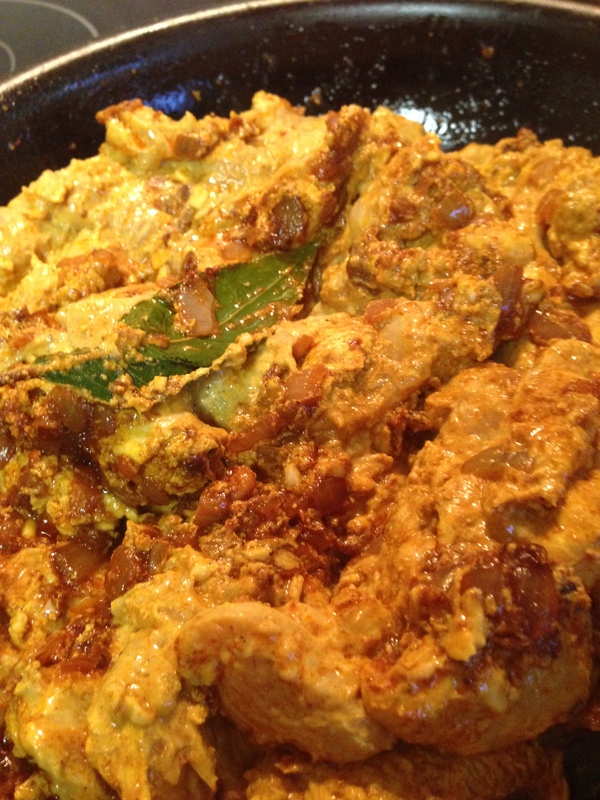 Add the chicken to the pan and fry at medium heat for 5 to 10 minutes, add the liquid ingredients and the cashew powder. Stir until it thickens. Cook for another 10 – 15 minutes until you’re happy with the consistency. I used chicken breast as that was what I had thawed, thigh would probably be better, though. 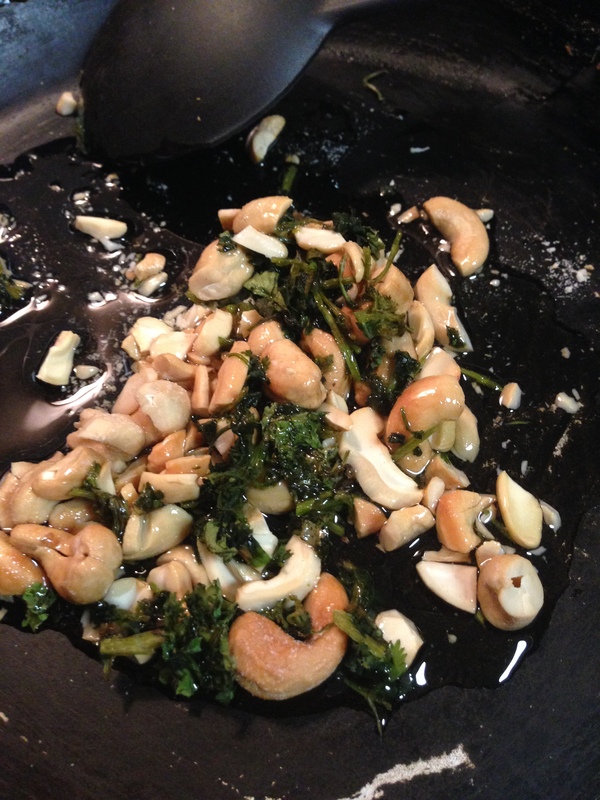 For the garnish on the top, I chopped up the cashews roughly and fried them off with the coriander. I always put dodgy coriander, stems, roots and all into a bag in the freezer. It doesn’t look at all pretty, like fresh coriander, but the the taste is far stronger. Fried and crunchy cashew nuts and crispy coriander, it was a great little trick that I hadn’t tried before. 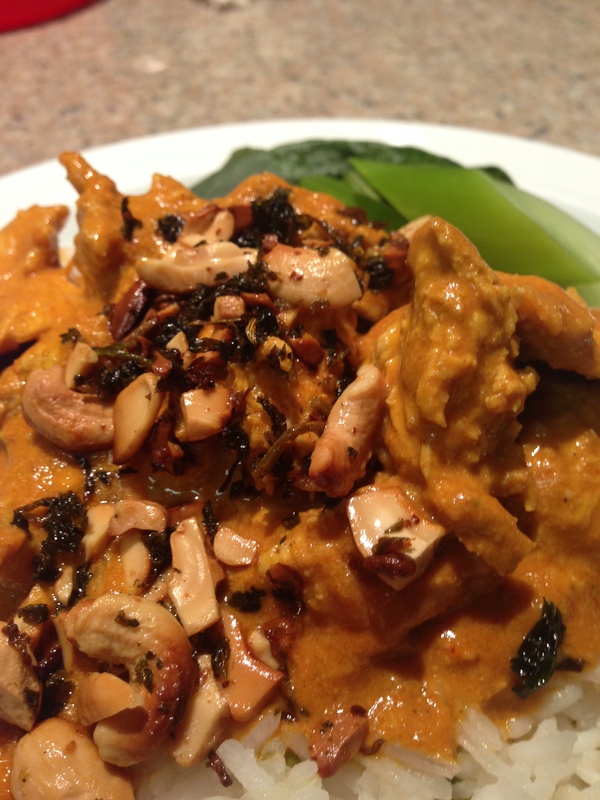 Chuck it all on a plate, and there you have it, Butter Chicken – Curry in a somewhat decent timeframe on a Sunday afternoon. 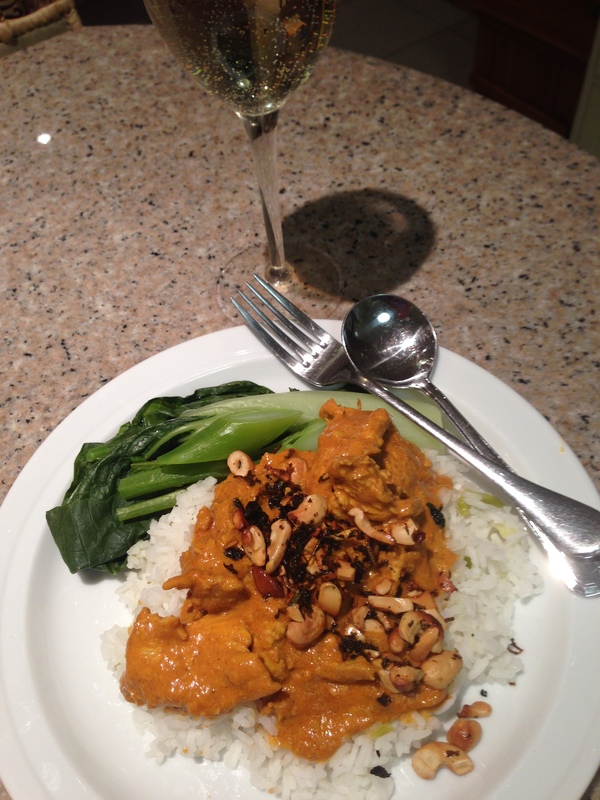 Next Post Twice cooked Chinese chicken – Little bit of this, little bit of that, a whole lotta of taste.